Mr. Holder contended that many of his other critics — not only elected Republicans but also a broader universe of conservative commentators and bloggers — were instead playing “Washington gotcha” games, portraying them as frequently “conflating things, conveniently leaving some stuff out, construing things to make it seem not quite what it was” to paint him and other department figures in the worst possible light. 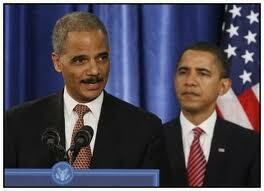 So who, exactly, is criticizing Holder because of his race? The Justice Department won’t say. Is he talking about Darrell Issa? Or the 60 congressmen, two senators, Republican presidential candidates and two governors who have called on him to resign? Or the seventy-five congressmen who have signed a House resolution for a vote of “no confidence” in Holder as attorney general? Or is Holder referring to people on the internet who have written about Fast and Furious, and criticized the Justice Department’s role in that scandal–like, say, me? Does he mean to include the 43% of voters who have an unfavorable opinion of him, compared to 19% whose impression is favorable? Eric Holder has politicized the Department of Justice to a degree not seen in modern times. He also has been the administration’s front man with respect to some very unpopular initiatives (e.g., trying to overturn voter ID legislation). And his department is up to its ears in a scandal of major proportions, involving hundreds of people who have been murdered–a scandal about which DOJ has stonewalled Congressional requests for information, and now admits that it supplied false information to Congress. Frankly, if Holder can’t defend himself against legitimate criticism without invoking utterly unsupported claims of racism, he isn’t up to the job of being Attorney General. Next comes Nation magazine. I know, the Iron Curtain has fallen, Communism is defunct, so why does the Nation still exist? (The real answer, of course, is that a small group of rich people fund it.) But that still doesn’t answer the question, why does anyone read it? The deep racism at the heart of conservative food stamp critiques offers at least one clue as to why the Obama administration has been unable or unwilling to champion SNAP [Supplemental Nutrition Assistance Program] as a valuable recession antidote: as the nation’s first African-American president, Obama is vulnerable to racist innuendo, which his opponents are only too happy to exploit. Furthermore, Ms. Ratner contends that “the food stamp program has remained surprisingly sensitive to people’s needs” and “is, in many ways, a model entitlement program.” Still, says Ms. Ratner, the food stamp program’s benefit levels are too “stingy,” and sensible anti-fraud efforts to reform the program, such as those proposed by Sen. Jeff Sessions, can only be the result of racism. Equally troubling, Jeff Sessions, an Alabama Republican with a record of racebaiting, led a charge in the Senate this past fall to “reform” food stamps by restricting eligibility and undoing a planned $9 billion budget increase, supposedly to crack down on fraud and government excess. Of course, Ms. Ratner offers no support for her claim that Senator Sessions has a “record of racebaiting.” The only race baiting going on here is in the pages of the Nation. Is there something suspicious about the effort by Sessions and other Republicans to reform the food stamp program? Hardly. As we noted here, the food stamp program is ineptly run, is riddled with fraud, and has doubled in cost under the Obama administration. The agriculture bill we are considering this week—part of three appropriations bills being irresponsibly crammed together—would result in a quadrupling of food stamp funds from their 2001 levels. 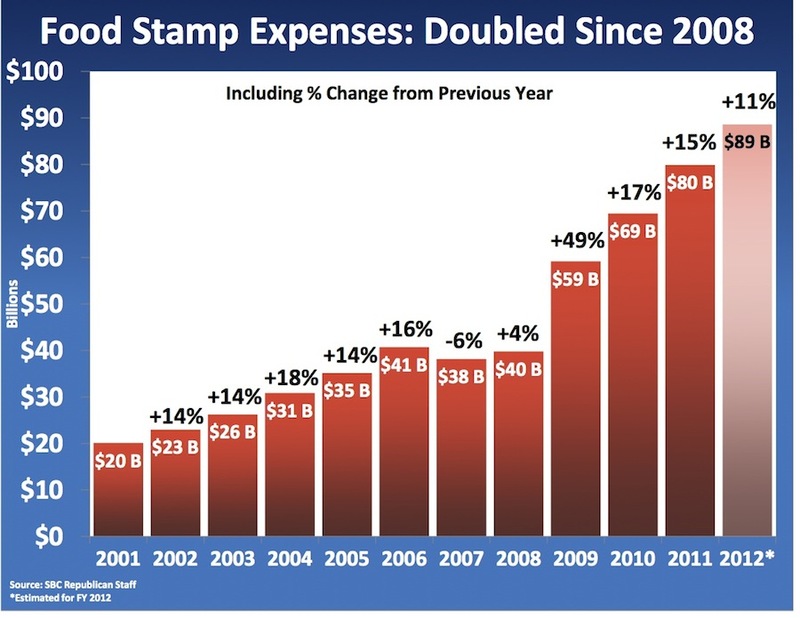 At a proposed $80 billion a year, food stamps are becoming one of the largest items in our budget…. The Wall Street Journal, in an article linked by Big Government, cites several shocking examples of the fraud that is causing the cost of the food stamp program to skyrocket. Nevertheless, according to the Nation, any effort to administer a government program in a competent manner apparently is a sign of “deep racism.” This despite the fact that as of 2006 (I haven’t tried to find more recent numbers), 68 percent of recipients were white. Race baiting: not just immoral, but stupid.